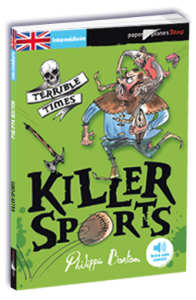 On the front cover of the book we can see two characters: two men who are practising sport. They are fighting. The background is green. The story is a fictitious story. It takes place in England, in Stoke Brunswick, in 1920. First, the main character is George Daventry, a teenager who works for Lord Corman. George Daventry polishes the Lord Corman’s family shoes. Then there is Lord Corman: he is very nice. Then there is Mr Carter who is the butler and he is authoritarian. At last there is the chauffeur: Mr Fender and he is less authoritarian than Mr Carter. One day Lord Corman saw George Daventry playing with a ball and asked him to play in the team of cricket. The son of Lord Corman will teach him how to play. Afterwards they will play a big match with the opposing team. I loved Killer Sports because I find it captivating. I enjoyed reading the first part because we learn a lot about the evolution of sports. I liked the second part because the characters are so realistic. As far as I’m concerned, I don’t want to play cricket because I’m not interested by this sport: I prefer basketball. Basketball is more dynamic than cricket.